Believe me it is a true Wendy's Bacon Mushroom Burger, it is just smaller here in the Philippines! From a classic Hamburger fastfood store, I think this is one of the most flavorful and mouth watering. The mushroom essence do embraces the overall taste more than the Bacon and I love mushrooms. A must try for fastfood burger lovers. Bacon Mushroom Melt is my favorite of Wendy's burger lines. 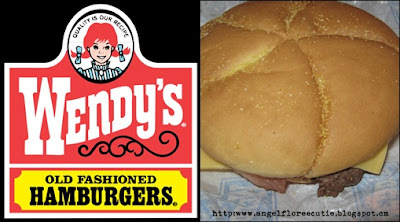 I was so glad I saw a Wendy's outlet at SM North Edsa when I went there last week. Gosh! I really miss eating in here so I did grab my usual favs. This one I forgot I think but I will surely come back and try this. Its one of my favorite burger!